TROPICAL Ginger es el lugar ideal para relajarse, rejuvenecer y revitalizarse a sí mismo ya su familia. Salón alrededor de una de las estaciones de cuatro piscinas, incluyendo una piscina de 50 metros. Pasear alrededor de 2. 5 hectáreas de jardines, que abundan wth hermosas flores de jengibre tropical. Cocinar y comer en el apartamento totalmente equipado, o al aire libre en el uso común de barbacoa y comedor. Disfrute de la conexión Wi-Fi y Netflix gratuitas que son únicas en el resort de mi apartamento. Tome un paseo de 10 minutos a la playa y las aguas del mar de Coral. Explore los fabulosos alimentos contemporáneos, en los cafés y restaurantes a lo largo de la playa y disfrute de las compras del complejo disponibles. Todos sus tours se pueden reservar en el sitio y si desea una de las famosas experiencias de Palm Coves spa que está disponible en el sitio también. Nuestro apartamento es propietario gestionado y está en una de las mejores ubicaciones en el complejo. 2 dormitorios con cama extragrande, cada uno con aire acondicionado, ventiladores de techo, persianas, radio despertador, ventanas que se abren y el segundo dormitorio tiene su propia nevera y TV LCD / DVD combo de pantalla plana, así como la opción de una cama king o dos individuales. Las puertas y ventanas están protegidas con pantallas que permiten la agradable brisa fresca sin la preocupación de insectos voladores que estropeen su estancia. Comedor independiente que se abre a un pequeño patio con vistas a una de las 4 piscinas del complejo (protegida por una cerca de la piscina). Aparcamiento bajo cubierto para su vehículo. Palm Cove es considerada la capital del balneario de Australia y tiene el romance de un pueblo junto a la playa. Se puede estar felizmente en el complejo y Palm Cove para la duración de sus vacaciones, pero hay mucho más que ver. El paraíso tropical donde la selva misteriosa encuentra la grandeza de la Gran Barrera de Coral. Las playas de arena blanca bordeadas de gloriosas palmeras de coco y el cálido océano durante todo el año hacen de Palm Cove una de las playas más hermosas del mundo. Añadir la atmósfera relajante y el sol tropical y usted tiene el destino de vacaciones perfecto! Visite el bosque tropical tropical, experimente la cultura aborigen, pasee a caballo, visite uno de los muchos parques de vida silvestre como Bird World, el Cairns Tropical Zoo o Butterfly World en los alrededores. Very clean and spacious. Loved our stay! Perfect location, only 20 minutes from Cairns and 40 minutes from Port Douglas in a small but beautiful beach community of Palm Cove. My one recommendation would be to provide more linens and not to air dry them. The towels were stiff and in short supply. No washcloths, hot pads, napkins or paper towels. Just a suggestion. I would gladly stay here again and recommend it highly. Thank you for taking the time to review the apartment I'm glad that you enjoyed your stay. I will have a chat to the cleaner - as far as I am aware there should have been ample towels for a 3 night stay. There should have been 8 towels, 2 bath mats, 2 guest towels and 2 face washers and 2 tea - towels left for each clean and I am not sure why the paper towels were not available. I'm not sure what you mean by hot pads - sorry! I really appreciate you bringing this to my attention and hope to see you again some time. Lovely comfortable apartment for a family holiday. Thankyou Janice for the wonderful stay in Palm Cove. It was more than what we expected! So many "extras" included like DVD's, Netflix, wi-fi, books, lovely furnishings, stroller and high chair for littlies. It was immaculately clean, great starter pack and the pool just out our bi-fold doors. The pool and air-conditioning was our saviour from the FNQ heat! Walking distance to the main street and beach, very quiet. We really appreciate the late check out, it wasn't a hassle and we felt right at home. Hope we can return some day. Hope the complex is able to do something about recycling soon. Thank you for your lovely words Kate and you will be pleased to know that I contacted the council and the Body Corporate committee this morning to see if we can get this recycling looked at again. I'm so glad you enjoyed your stay and I hope to see you again sometime. I stayed in this property with my family and really enjoyed it. It is well appointed with everything you need for an extended stay. I really liked having two master bedrooms with en suite bathrooms - no sharing with my daughters! I would stay here again in a heart beat. This was our third stay at Tropical Ginger. We absolutely love this apartment, and we love Mango Lagoon Resort. Palm Cove is a fantastic destination in Tropical North Queensland . The apartment is very well appointed with everything a family could need. It’s clean, comfortable and spacious. My wife says the bed is the most comfortable she’s ever slept in! The owner is very easy to deal, prompt and professional. The resort itself is wonderful, 4 pools - we only used two - the resort is huge. The grounds are beautifully maintained, it’s a true tropical paradise. It’s located in a quiet area, and was just a 5 minute walk to the esplanade for us. Best beach to swim at (in the enclosed swimming area). Exceptionally clean. Lots of places within walking distance to eat and shop. Grocery shopping 5 minutes away by car. Public buses easy as well and last/first stop is right at Mango Lagoon doorstep. Thanks for your lovely review Michael. I'm so glad that you enjoyed your stay and I believe that even the weather behaved itself for you! Anytime that you want to stay again, you know where I am! 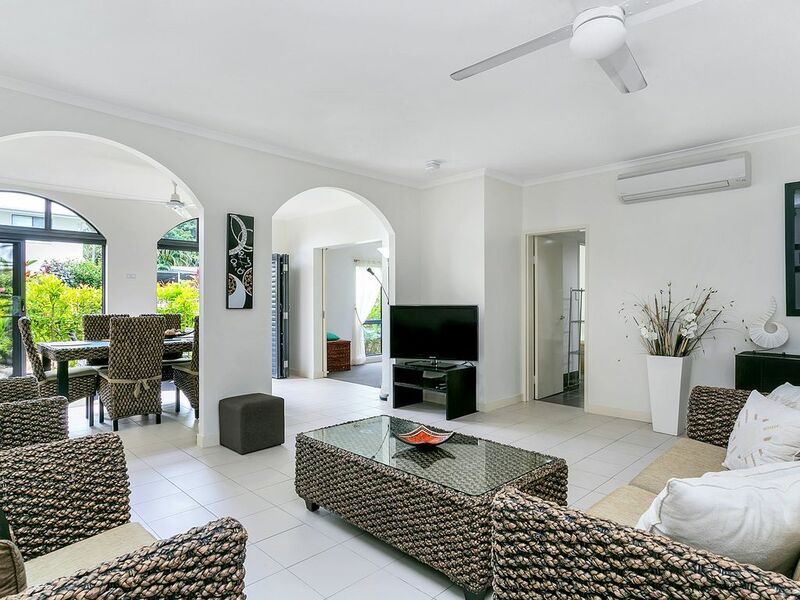 This apartment is very well positioned within Palm Cove, within a short walk to the beach, shops and restaurants. It's set within a beautiful and calm tropical resort with fantastic swimming pools. It really feels very exclusive. The flat also is much bigger that it looks in the pictures and it has everything to make your stay very enjoyable. We had amazing time during Christmas 2015 and would definitely recommend this to anyone considering staying in the area.